Once again, another potato curry, but do we get tired of potatoes, definitely no. 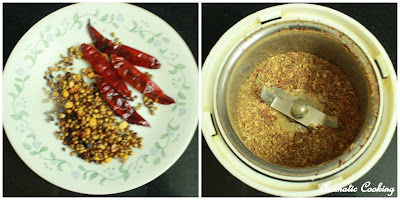 This curry is similar to the Kathirikkai Podi Curry, with only a little variation here and there, but still I thought I should do a separate post on it. 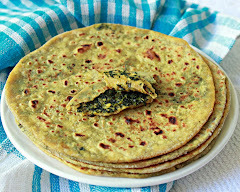 It tasted awesome with a mild fenugreek flavor and goes well with almost anything, especially tastes very good with sambar and curd rice..
Roast the ingredients given under ' to powder ' in very little oil, in the order given, adding the fenugreek seeds last, taking care not to burn the fenugreek seeds, tastes bitter. Cool, powder coarsely and keep. 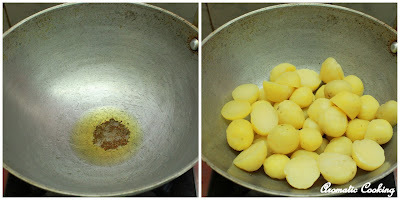 Heat some oil, add the mustard seeds, when it starts spluttering, add the potatoes and keep roasting on low heat for 5 to 7 minutes. Then add the turmeric powder, salt, asafoetida and the ground powder, mix for 2 minutes. Add the curry leaves, if needed a little more oil and keep frying for another 3 to 4 minutes. Remove and serve warm. 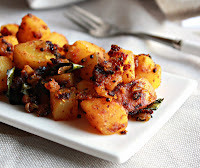 You should do this curry with potatoes that don't become mushy while frying, don't use the ones used for mashed potatoes. 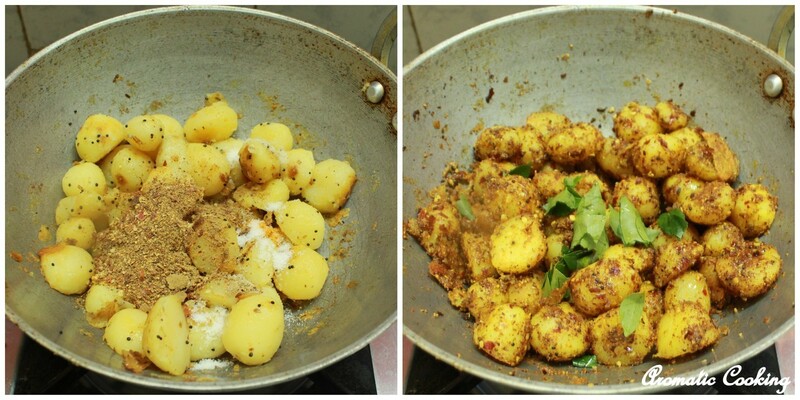 The colour of the dish itself is very pleasing and attractive and highly irresistible potato curry. Nice roast, love the masala. AH! looks so awesome. I love your potato creations. wowww,it looks awesome dear..nice clicks!! 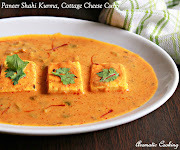 Hema, this dish looks so tempting! 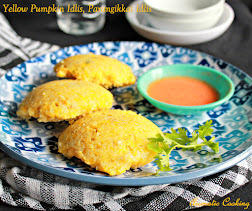 I am sure they will taste as delicious as the baingans! 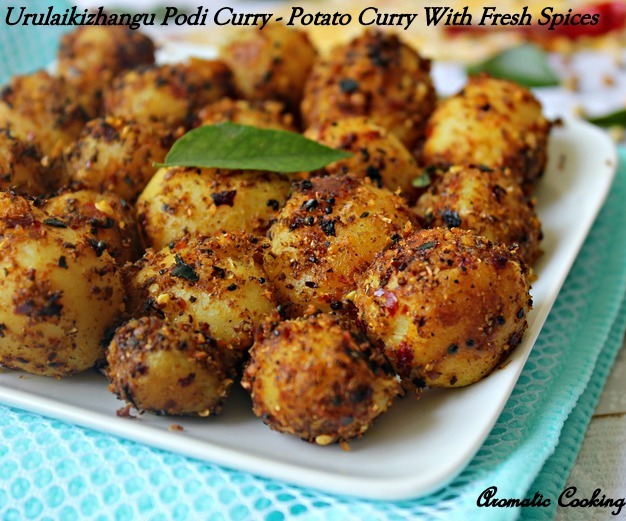 Delicious potato curry with powder love it. I want to try it!!! hopeful this weekend I'm able to do this dish!!! Super tempting and mouthwatering curry !! this is out of the world! gorgeous cute little potaotes. nice dish dear! 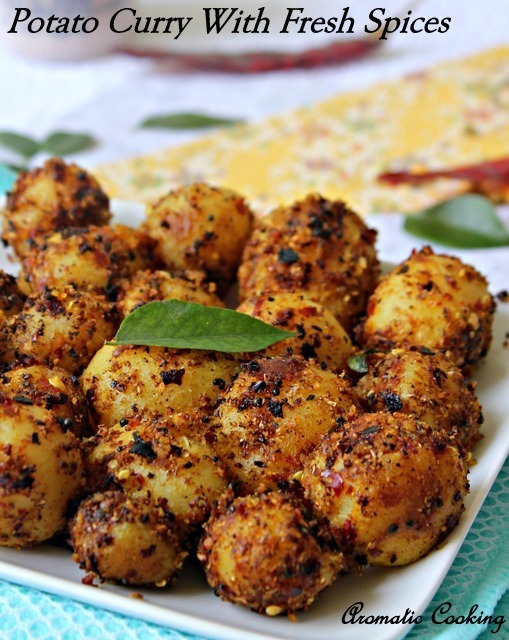 I guess this is a side dish but I am sure I would end up snacking on these scrumptious looking potatoes!! Love the amount of spice on these, will be cooking these up soon! love freshly crack masala on potatoes. Do visit me too. 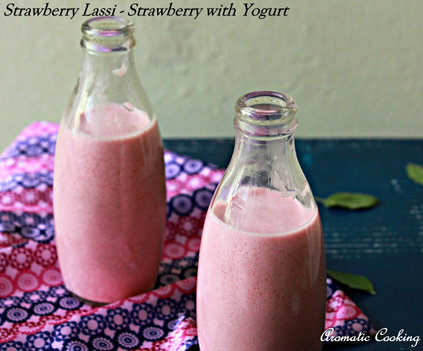 Its my favorite dish thanks to making this one more special recipe.